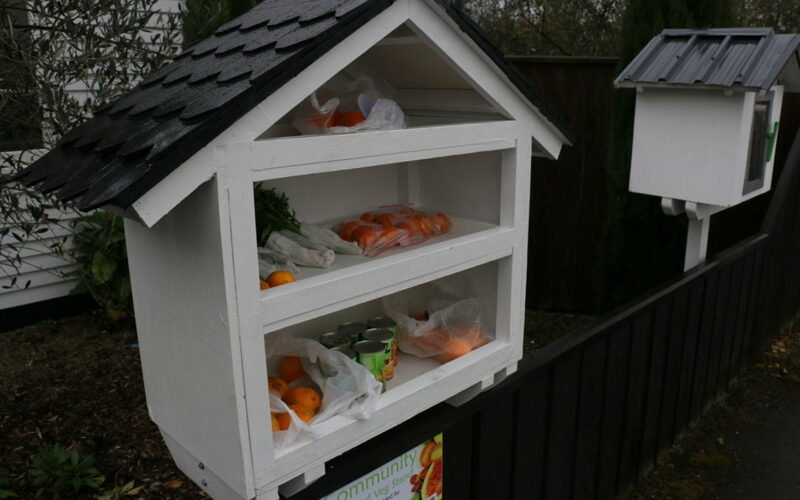 Community food pantries simultaneously tackling hunger and wastage are popping up all over the country and Wairarapa is no exception. Fresh herbs, vegetables, citrus fruits, and canned foods have been in steady rotation at a new white stand on Carterton’s main street. It’s the latest addition to community food stalls around the region, with ones already established in Martinborough and Featherston medical centres. Carterton real estate agency Jo-Kelly & Co is responsible for the stall outside its High St office. Co-owner Jo Wisler said it was only installed last Friday but had already seen a lot of action. “It’s had a really good response – amazing actually. What was on offer was changing by the minute. She said she was always busy with her job and her veggie garden was somewhat “free-range” these days, producing more food than she and her family could get through. “We all have excess produce at some point, and what goes around comes around,” she said. Wisler said marketing manager Brooke Malyon had initiated the stall idea, having caught on to the craze that’s been taking off around New Zealand. “We just loved the idea,” Wisler said. The Carterton Menz Shed whipped together the stand with supplied materials. The pantry follows a public miniature library, also set up by the agency which said it had proved popular.